I’ve turned over a new Leaf, and will no longer be burning fossil fuels on my daily trek to work. The car in that race was a one-of-a-kind, to be sure, but these days high-end electric cars perform as well as high-end conventional cars. My family sedan isn’t a Tesla, but when I stomp on the accelerator, it moves. 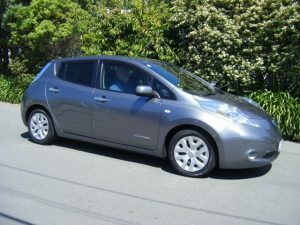 It’s got more than enough pep for a commuter car, and it sails right on up Tinakori hill, at the end of my homeward journey, with much less obvious effort than my old car did. Electric vehicles (EVs) may be pricier up front, but are less expensive to run, especially when you factor in lower maintenance costs from fewer moving parts. A recent study by the Union of Concerned Scientists shows that even in the U.S., where gasoline is cheaper than the global average, EVs are a good economic choice as well as being better for the environment. As the cost of solar power continues to drop, battery technology continues to improve, and as more EVs become available, the cost of ownership will keep doing down. Here in New Zealand, where most of our electricity comes from renewable sources, the choice will soon be a no-brainer. EVs are the future. Fuel prices: at around 2 NZD per litre for petrol (gasoline) here in Wellington, and an exchange rate of 1.00 NZD == 0.70 USD, that’s about $5.30 US per gallon. The current global average is about 1.10 USD per litre.